Treating sweet itch can be very frustrating as at the present time there is no cure for sweet itch. Once a horse develops the allergy it generally faces a life-sentence and every spring, summer and autumn will become a distressing period for both the horse and the owner. Treating Sweet itch is incredibly frustrating, however it can be made easier providing you take the time to understand the exact nature of your horses problem. Your horses comfort and well being are down to you, its owner. And unfortunately the only reliable treatment for sweet itch at the moment, is to prevent the midges biting your horse. Stable your horse during peak fly periods and only turn-out when fly numbers are low. Stable at dusk and dawn, when midge feeding is at its peak, and close stable doors and windows, midges can get into warm stables. The installation of a large ceiling mounted fan can help create less favourable conditions for the midge. For slight to moderate cases of Sweet Itch this can help. However a seriously itchy, stabled horse has hours of boredom to think up new ways of relieving his itch. Manes and tails can be demolished in a few hours of scratching against a stable wall. So, If stabling a sweet itch suffering horse can be avoided, it is best to do so. 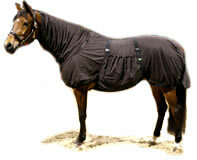 Follow a few simply rules and you’ll help your horse stay comfortable. Avoid marshy, boggy fields. If possible move your horse to a more exposed, windy site. Like a bare hillside or a coastal site with strong onshore breezes. Chalk-based pasture and grassland will have fewer sweet itch midges than heavy clay pasture. Ensure your paddock is well drained and well away from rotting vegetation. Stay well away from the muck heap, from old hay-feeding areas and far from compost and rotting leaves. Good use of electric fencing to help prevent your horse from rubbing, will help prevent skin damage. But it won’t treat or prevent the underlying sweet itch problem from developing.